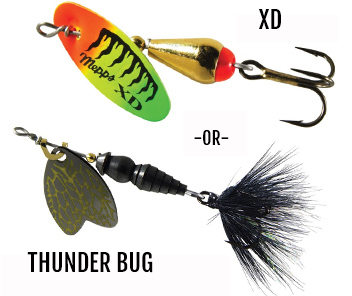 Get a FREE Mepps XD or Thunder Bug spinner! Order $40* or more worth of Mepps lures before April 30th and you'll get a FREE Mepps XD or Thunder Bug spinner. Not only is your spinner FREE, but you get to choose the size, color and hook type (single or treble, plain or dressed) when you checkout.